Her boyfriend Bobby will be there, too. 25 years ago, Laura Palmer promised she would return to Twin Peaks. Now, it’s officially happening. Actress Sheryl Lee, who played the prom queen in the original series is on-board for the nine new Twin Peaks episodes coming to Showtime next year. She’s not coming to the dance alone, either, but is bringing her leather jacket-wearing boyfriend, Bobby (Dana Ashbrook) with her. They made their announcement at the Twin Peaks UK Festival, according to fan site Welcome to Twin Peaks. It remains to be seen how the two characters will be incorporated into the cult hit, particularly because the new season is set in present day—25 years after the haunting finale in season two. As anyone who had an “I Killed Laura Palmer” t-shirt in the ’90s can calculate: That means Palmer will have been dead for a long time. Though the show’s third season won’t premiere until 2016, there’s plenty to keep fans of the cult show happy—David Lynch is directing all the episodes and Kyle MacLachlan is returning for another damn fine cup of coffee. There is also an exciting rumor going around that Sherilyn Fenn—last seen playing an FBI wife on Showtime’s Ray Donovan—will reprise her role as bad-girl-in-bobby-socks, Audrey Horne. Showtime has said that many of the original cast will be returning for the third season. 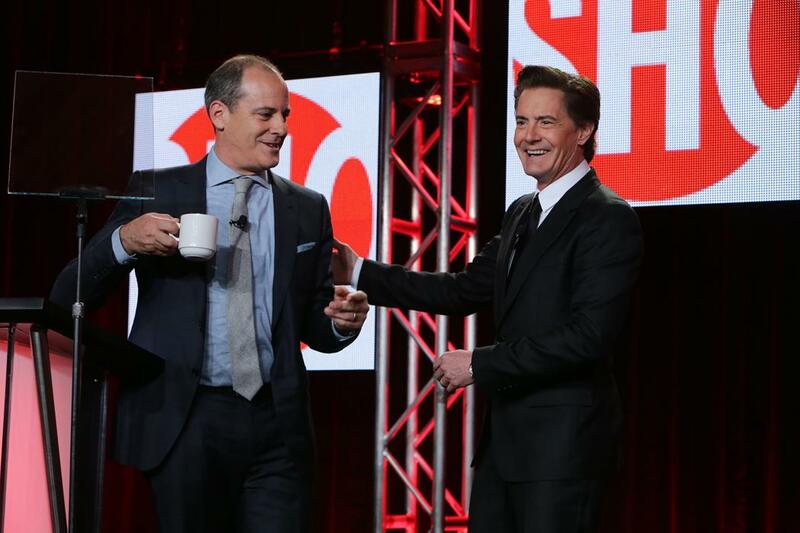 All-new episodes of Twin Peaks will premiere on Showtime in 2016. Correction: An earlier version of this article misidentified which vehicle was the preferred mode of transport of Bobby, one of Laura Palmer’s several boyfriends. Bobby does not usually ride a motorcycle, unlike Palmer’s other boyfriend, James. Last year, Twin Peaks fans across the world were given cause to celebrate, after director David Lynch announced that a second series of his cult Nineties TV show was in the works, and scheduled to be broadcast in 2016 on the US network Showtime. Now, Lynch has thrown cold water over everyone's hopes, by hinting that the project may be in trouble. "I'm not sure at this point if it's happening," the director told an audience at the opening of the Between Two Worlds exhibition in Brisbane, when asked if the planned reboot was definitely going ahead. He then stated that there were "complications". An unnamed source told the website Welcome to Twin Peaks that, while the script for the series is complete, “contract negotiations aren’t going as expected". Last year, it was reported that a number of original Twin Peaks cast-members, including Kyle MacLachlan, would reprising their roles in the new series. Twin Peaks, created by Lynch and Mark Frost, was first broadcast in 1990. Set in a small, mysterious US town, the series was centred around the murder of young girl named Laura Palmer. Showtime’s Twin Peaks is still apparently on track. Creator David Lynch reportedly made some dire comments about his Twin Peaks reboot’s odds of happening at a panel in Australia for his new art exhibit last weekend. The writer-director reportedly said Showtime’s resurrection of his classic ABC series was “still up in the air” and “there are complications” and that he doesn’t know if the revival is still on. Still, Lynch’s participation is still considered pretty crucial. Lynch is signed to direct all nine episodes and it’s hard to imagine Twin Peaks returning without his blessing. We reached out to Lynch’s representative for more clarity, but the rep had nothing to say about the director’s comments. Perhaps Lynch simply hadn’t had his morning coffee yet? BBC Radio 4 is to broadcast a documentary on David Lynch's Twin Peaks next month (April). The documentary will be presented by writer and Film 2015 pundit Danny Leigh and feature contributions from Rob da Bank, who will discuss the influence of the show's soundtrack, crime writer Denise Mina and Andy Burns, author of the Twins Peak book Wrapped In Plastic. Actor-director Richard Ayoade, whose own work has been inspired by Twin Peaks, will also contribute. The documentary is set to air on Monday, April 6 at 4pm. In the meantime, watch a trailer below. Last October (2014) US cable network Showtime announced that it was bringing back Twin Peaks for a nine-episode run in 2016. David Lynch is set to direct from scripts he has co-written with his Twin Peaks co-creator Mark Frost. The project appeared to be running smoothly in January, when Kyle MacLachlan confirmed his return as Agent Dale Cooper. However, speaking at the opening of his 'Between Two Worlds' art exhibition in Brisbane, Australia earlier this month (March), Lynch cast doubts on the planned revival by telling fans: "I'm not sure at this point if it's happening." Lynch added that the revival has been hit by "complications", reportedly owing to difficult contract negotiations. Alongside MacLachlan, the cast of the original Twin Peaks series included Michael Ontkean, Lara Flynn Boyle, Sheryl Lee, Mädchen Amick and Sherilyn Fenn. David Duchovny, who appeared as Agent Denise Bryson in three episodes, has recently said he is keen to return. It's like a girl without a secret, pies without cherries, or a sheriff station without donuts. At least that's what the original "Twin Peaks" cast thinks now that Lynch has left the upcoming reboot. On Tuesday, the 25th anniversary of the "Twin Peaks" premiere on April 8, 1990, the cast compiled videos saying what the show would be like without the co-creator as a part of their #SaveTwinPeaks campaign. The video includes Sherilyn Fenn, Dana Ashbrook, Sheryl Lee, James Marshall and Peggy Lipton, among others. The filmmaker announced his departure from Showtime's reboot on Sunday night, tweeting, "I left because not enough money was offered to do the script the way I felt it needed to be done." Lynch tweeted that he called the cast over the weekend to tell them he was leaving the project. Showtime responded to Lynch's tweets saying the network still hopes to bring Lynch back on board. Previous to his announced departure, Lynch had alluded to negotiation problems with Showtime, saying that the reboot was "still up in the air." 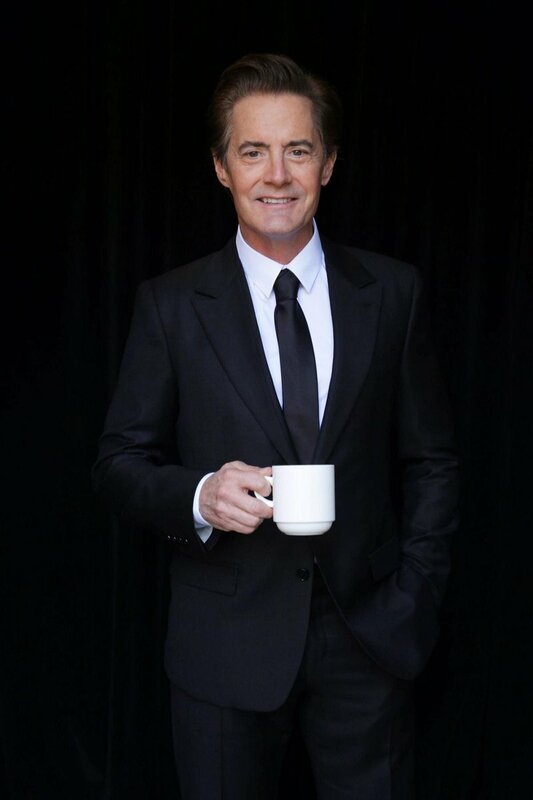 Kyle MacLachlan was the only "Twin Peaks" actor officially confirmed to return to the new series, although Ashbrook and Lee previously revealed Lynch called them to reprise their roles. Showtime announced last October that nine new episodes of "Twin Peaks" would air in 2016 to coincide with the 25th anniversary of the series two-season run. David Lynch loves women. They are at the center of nearly all his films—from Blue Velvet to Mulholland Drive—and his groundbreaking TV series, Twin Peaks, which premiered in 1990 and is set to return on Showtime on May 21, with 18 new episodes, all directed by Lynch. “Who killed Laura Palmer?” provided the motivating plotline for Twin Peaks, but the investigation into the mysterious disappearance of the beautiful high school student really served as an entrée into a dark and fascinating Lynchian reality. The world according to David Lynch is vaguely retro (his women often dress like 1950s starlets); consistently eerie (there is strangeness lurking around every corner); and oddly wholesome (coffee and pie are always present). He is the master of the juxtaposition of the creepy and the sweet, the sexual and the chaste. And at the heart of this tense, intriguing friction, you will always find Lynch’s women. Like a doting parent, Lynch gives his actresses nicknames: Watts is Buttercup; Patricia Arquette, who starred in Lost Highway (1997), is Solid Gold; and Dern has been Tidbit since she was 16, when Lynch cast her in Blue Velvet. Actresses Hailey Gates (who hosts the Viceland TV series States of Undress) and Chrysta Bell (who is also a musician) are both in the reboot of Twin Peaks, and have yet to be rechristened. Their roles—just like the show itself—remain shrouded in secrecy. There is no question, however, that the new Twin Peaks will retain the surreal, dreamlike quality that made the original so addictive—something the artist Alex Prager tapped into in creating her homage to Lynch and his incredible coterie of women. I was never really interested in Twin Peaks when it came out when I was a kid. Fairly recently though I watched Mulholland Drive and, man, it totally blew my head. In fact, it might just be one of the most intriguing films I've ever seen. I've been meaning to watch Inland Empire and Blue Velvet for a while now. I guess I'll also have to watch the new Twin Peaks series too. I loved it since the first episode when I discovered it during high school, the second series had lost a bit of its shine but the end left me wondering for years. When I discovered two years ago that finally an epilogue series was in the making I got all hyped up, only to be let down by the various delays and petty problems. I had forgotten about this until recently I looked it up again and I've discovered that actually at long last the beginning of the elusive third season is not far off! I guess I have to postpone my re-watch of Poirot to refresh my memory about the first two series. Mulholland Drive is easily his best work. Twin Peaks was an excellent show, but a mere footnote to the towering TV achievement of Peyton Place. Although the cast is obviously mostly excellent and any returning players are welcome, I think it reveals Lynch's worst traits that he has (apparently) REFUSED to hire Lara Flynn Boyle as payback for her not returning for Twin Peaks: Fire Walk With Me. This, in spite of her pleas. She was central to the success of the show (the great montage of grieving that opens the series--and especially her role in it--is the series high-point). Boyle was a daring artist--as proven by Twin Peaks and the MAGNIFICENT films Equinox and Afterglow. She was also cursed with a particular kind of youthful beauty and has disfigured herself trying to maintain that beauty through really unfortunate plastic surgery. If Lynch weren't so spiteful, he might have provided the opportunity to redeem her ravaged humanity in Twin Peaks Season 3. Last edited by TrueFaith77 : 05-08-2017 at 03:56 PM. I still haven't finished episode 3. It's all very... intense. Oh good, people here are talking about Twin Peaks. I watched the original on Netflix and loved it. Then I saw that they're doing a revival. I have seen all four of the current episodes on Showtime and all I have to say is wtf!? This is so weird. The original was weird, but it was subtly weird. The new one is just beyond weird. Like every little thing is as weird as possible. Does anyone understand what is going on yet.